One of the coolest artifacts we have on display here in the Ramsay Archives at Wabash is this printing plate. 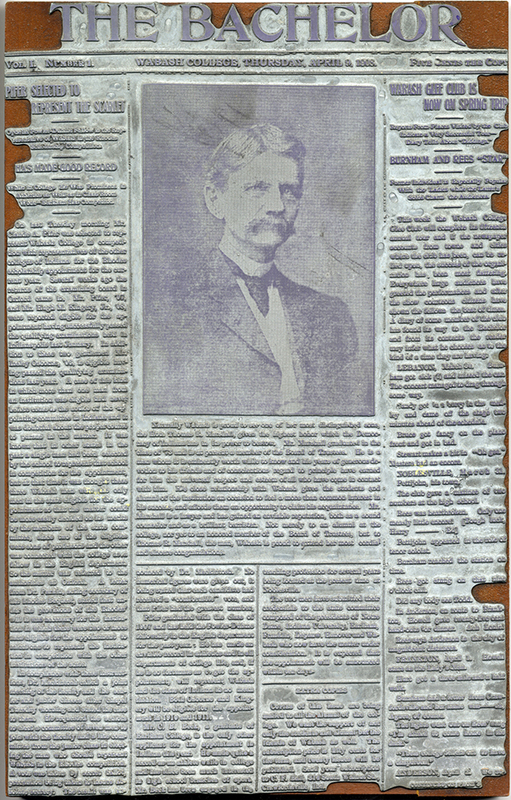 Featuring a large photograph of Thomas Riley Marshall, this is the plate that printed the first ever issue of The Bachelor, the campus newspaper that is coming right up on its 110th anniversary. This issue was published on April 9, 1908 just as Marshall had captured the nomination of the Democratic party for Governor of Indiana. In the fall Marshall won the election and it was this victory that propelled him on to the national stage and into Woodrow Wilson’s administration. Also mentioned on this inaugural front page was the competition to represent Wabash to the Rhodes Scholarship committee. Wabash had three men qualified, but the Rhodes people stated clearly that only one man could represent Wabash. A committee comprised of faculty members and delegates from the junior and senior classes at Wabash took a secret vote and chose Claude A. Pifer [W1907] as our applicant. By April 20th The Bachelor was reporting that Pifer had won the Cecil Rhodes scholarship to Oxford, beginning a rare new tradition at Wabash. Here is the paper that was printed off of this plate. In addition to the other items of news, the article in the right column is a report on the glee club spring tour of nearby Indiana towns. Reading these reports, one gets the idea that the tours were more exciting than it would appear from the destinations – Noblesville and Anderson are not far and certainly not exotic destinations. Still, there were hotels, friends of the college, alumni and, perhaps best of all to the glee guys, pretty girls in each town. The reports of these tours always include notes of a young man who “lost his heart” while on tour. The back pages of this paper are filled with advertisements for local stores, restaurants and services. The Bachelor started off on a strong footing which included significant support from local businesses and alumni. 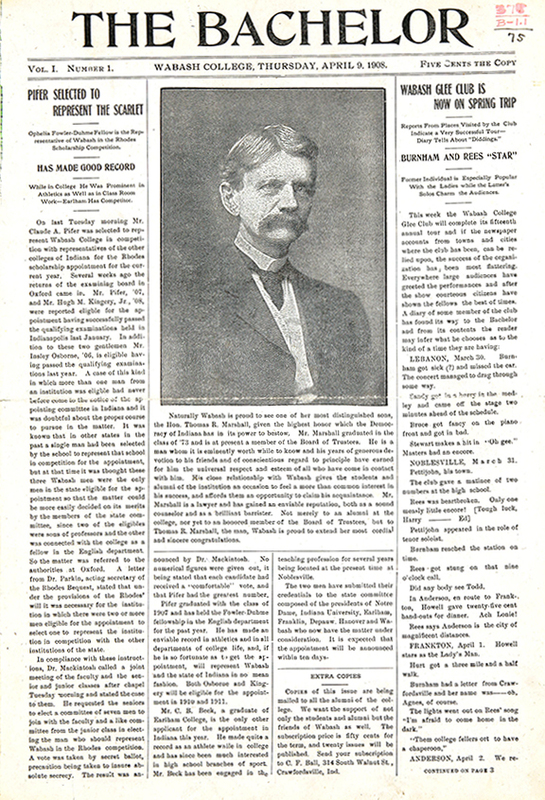 This first issue contained a call to all students to bring forth their news, write for the paper or simply to talk it up so that others would support it. And 110 years later, the paper is still doing just what it did in the beginning. It highlights the accomplishments of Wabash men, current and past. It reports on immersion trips – large and small. It delivers sports coverage and editorial content in a timely manner. So here’s to The Bachelor and another 110 years of documenting the life of this college and the lives of her faculty, staff and students.